de Jong Dream House: Kitchen cabinets installed!!! Today was a very exciting day for us. We went back to the house--which is a bit more of a drive now that we're settled in our apartment--to the mostly finished installation of our kitchen cabinets! It's not completely done because there are a few electrical issues that need to be addressed before the front panel of the outer island goes on, and the marble top baking center will be added in a few weeks with the rest of the countertop, but other than that, our kitchen cabinets are installed! As a little background, I love to cook so the kitchen was a top priority to me. Since I live with a brain injury, we put a lot of thought into using as much universal design as we can afford. The floors will be cork for greater sound proofing, which means my son will finally be able to have playdates. (Hardwood floors are terrible for my headaches. So happy to be rid of them!). 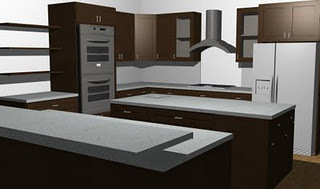 We'll have extra wide halls, rockers instead of light switches, levers and pulls instead of knobs, a raised dishwasher, lots of drawers for base cabinets, touch activiated faucets, etc. We tend toward function over form, but really wanted an accessible kitchen that was more transitional/modern than nursing home! 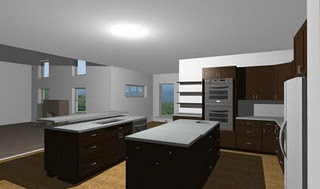 This was our rendering as of several months ago. We've made a few changes.The command center in the nook is a little different, with open shelves on top, and doing away with the desk extension on the left. We've also added arches over the command center and wall by the frig into the mudroom. The pantry door will be espresso framed with frosted glass. This view is from the dinette. I see that I need to go back and get a better shot. The first picture is from December 15, the second picture is from the 14th. The legs on the first picture show approximately where the open lowed baking center will be. Here's the view from the great room. The big change here is that we took down the wall with open shelves to take advantage of all the fantastic natural light from the dinette. This view is from the command center, looking into the dinette and great room. Again, the only change is the wall with the open shelves is gone. And now for a little detail. 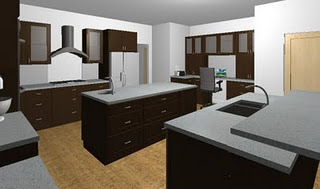 The cabinet are solid maple shaker style with espresso stain. They look almost black, but they are really a rich brown. This is pretty color-accurate. All of the drawers are full extension, including these super wide drawers by the baking center. All the drawers and cabinets are soft close with Blumotion, another way to reduce noise in the house. Joe Yoder did a fabulous job. We are so impressed with his quality. The dovetails are perfectly smooth. The shelves are perfectly smooth and lined up with the frames. Hardware. We chose pulls over knobs for ease of use as we age in place. Frig surround. We chose to keep the top open rather than put doors on because I'm only 5'4" and have never used a cabinet above my frig. Instead, I'l have two baskets, one for our first aid kit and one with our cleaning supplies (out of the reach of our toddler). Continuing left is the cooktop, with three big drawers underneath it. The top drawer is a shallow one, which I"ll use for spices and wooden spoons. The other two drawers and nice and deep for pots and pans. Next up is a row of cubbies for my cooking oils and wines. This was my cabinet maker's idea for the space instead of a dead space filler. I love it! On either side of the cooktop we have upper cabinets with frosted glass. They're still a bit dusty. One thing I really appreciated is the way the glass is sealed. In our last kitchen, our glass cabinets rattled whenever you closed them. Between the soft close and the seal, it's nice and quiet! In the corner, we have a lazy susan. Next to the lazy susan is the microwave drawer with deep drawer underneath. There's also a cabinet above the counter. Next to the microwave is the double oven, which is a nice height for me, that is, lower than a typical double oven. This allowed room for racks above it for storing cookie trays and cutting boards. There's also a small drawer below for my bread pans. Next to the wall ovens is a bank of drawers that I'll use for all my baking things. The drawers turned up a lot wider that I had imagined, so there's a good chance that I may use a drawer for our board games or our son's toys. The top of the counter will be the new home for my brand new Kitchen Aid mixer. I've wanted one forever, and Niels found a killer deal on Black Friday. Instead of the full wall with open shelves we originally planned, it'll be a half wall into the dinette. We needed the half wall for the Kitchen Aid's outlet. Next to the bank of drawers will be my open lowered baking center. We designed it to accommodate a wheelchair, if needed. But we can always use it for kneading dough and rolling out cookies--which I'll now be able to do without standing on my tippy toes! And, there's room for our son (and a friend) to help! We were planning to put the same quartz on the baking center as the rest of the counter, with a piece of marble on my wishlist for someday. An unexpected surprise is that when we looked at remnants for the bathroom vanities, we found a slab of carrara marble that was just the size we needed. The inner island will be my prep island. Here's a view of it from the cooktop side. From the left, there's the recycling center, in the middle is an adjustable shelf that once again makes clever use of some dead space. I'll use this space for paper towels and wipes. On the right will be the prep sink with a tip out drawer and cabinet below. This is the other side of the prep island. There are two banks of drawers where we'll keep most of our dishes, and then rest of the recycling center. You can see the built in dividers for utensils and silverware in the top drawers. This is our touch-activated recycling center. It uses Blumotion. It is a much improved version of the idea I got at Ikea about a year ago. Here's the inside of the recycling center. The two bins on the bottom are for trash and glass/plastic recycling. The top drawer will hold two baskets, one for paper recycling and one for odd recycling, like light bulbs and batteries. We wanted to make it really easy for family and friends to recycle by having everything in one place. This is the Blum servodrive that opens the recycling center with a gentle push. Finally, this is the entertainment/clean-up island. From the right, there's a bank of drawers, single bowl sink cabinet and dishwasher. We raised it a little bit to make it easier to unload. Both sinks have Rev-a-shelf tip out drawers for my gramma's scrubbies. This is the outside of the entertainment island. We'll have three bar stools here. The panel for the outside island isn't installed yet because there are a few electrical tweaks that need to happen first. The command center should be installed in a few weeks, and the pantry furniture will be moved in after painted. What kind of wood used to desing kitchen cabinet?